June 6, 2012 - FedEx announced its decision to permanently retire from service 18 Airbus A310-200 aircraft and 26 related engines, as well as six Boeing MD10-10 aircraft and 17 related engines. The majority of these aircraft are currently parked and not in revenue service. As a consequence, a non-cash impairment charge of $134 million ($84 million, net of tax, or $0.26 per diluted share) was recorded in the fourth quarter. The decision to permanently retire these aircraft will better align the U.S. domestic air network capacity of FedEx Express to match current and anticipated shipment volumes. These permanent retirements are in addition to five Boeing 727-200 aircraft retired in the fourth quarter of fiscal 2012 and the planned fiscal 2013 retirement of 21 B727 aircraft, which will be fully depreciated. FedEx Express continues to modernize its aircraft fleet by adding newer aircraft that are more reliable, fuel efficient and technologically advanced, and retiring older, less-efficient aircraft. In response to the company’s new fleet plans, FedEx Express is shortening the depreciable lives of the following aircraft and related engines: 31 additional Boeing MD10-10s, 18 additional Airbus A310s, four B727s and one Boeing MD10-30. This will accelerate the retirement of these aircraft to align with the delivery schedule for replacement Boeing 767-300 and Boeing 757-200 aircraft. The accelerated depreciation on these aircraft is expected to total $196 million over the next three fiscal years with a partial offset from the avoidance of depreciation related to the retirements. 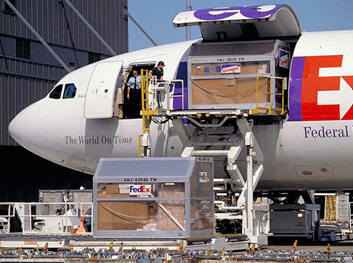 As of February 29, 2012, FedEx Express’s fleet totaled 688 aircraft, including 397 jet aircraft. In fiscal 2011, FedEx Express spent $3.2 billion on 1.2 billion gallons of jet fuel. The B757 is significantly more fuel efficient per pound of payload and has 20% additional payload capacity than the B727 it replaces. The B767 will provide similar capacity as the MD10s, with improved reliability, an approximate 30% increase in fuel efficiency and a minimum of a 20% reduction in unit operating costs. The B767 shares spare parts, tooling and flight simulators with the B757.